Geoffrey Of Monmouth (c.1100-1154) wrote completed his History it in its final form in 1147. Although it purports to be a book of historical fact, it is more a collection of ancient tales and legends, concerning, for example, King Arthur and Merlin. This manuscript has detailed pencil sketches of a number towns added in some of its margins; these are exceptionally early examples of eye-witness 'cityscapes'. Some of them seem to have been executed in two stages: first with faint grey pencil, and later with darker brown 'crayon'. The text on the lower part of this page concerns the founding of York by Ebraucus, a British king who is supposed to have reigned in the 10th century BC. 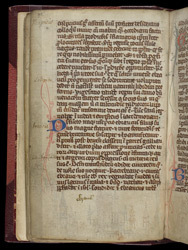 Sketches of kings are visible in the left margin, and a view of York in the lower margin.